This Very Short Introduction gives listeners a concise, accessible, and sophisticated overview of the vital elements of American democracy, emphasizing both how these elements function, their historical origins, and how they have evolved into their present forms. American politics seems to grow more contentious and complicated by the day, and whether American democracy works well is hotly debated. Amidst all this roiling partisan argument and confusing claims and counterclaims, there has never been a greater need for an impartial primer on the basics of the American political system. This Very Short Introduction gives listeners a concise, accessible, and sophisticated overview of the vital elements of American democracy, emphasizing both how these elements function, their historical origins, and how they have evolved into their present forms. 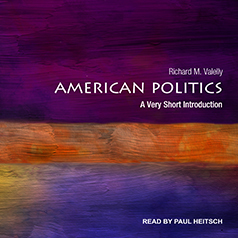 Richard Valelly covers all facets of America's political system: the bicameral Congress and the place of the filibuster, the legislative-executive process, the role of the Supreme Court, political parties and democratic choice, bureaucracy, the partisan revival, and the political economy. He offers as well an original analysis of the evolution of the American presidency and a fascinating chapter on the effects of public polling on political decision-making and voter representation. Valelly shows that the American political system is, and always has been, very much a work in progress—unfolding within, and also constantly updating, an eighteenth-century constitutional framework. In a refreshingly balanced and judicious assessment, he explores the strengths of American democracy while candidly acknowledging both gaps in representation and the increasing income inequality have sparked protest and intense public discussion. Finally, Valelly considers the remarkable persistence, for more than two centuries, of the basic constitutional forms established in 1787, despite the dramatic social changes that have reshaped virtually all aspects of American life. For anyone wishing to understand the nuts and bolts of how our political system works—and sometimes fails to work—this Very Short Introduction is the very best place to start.